1.The Daily Stoic by Ryan Holiday and Stephen Hanselman.This book is an incredibly effective way to practice mediation/mindfulness on a regular basis. 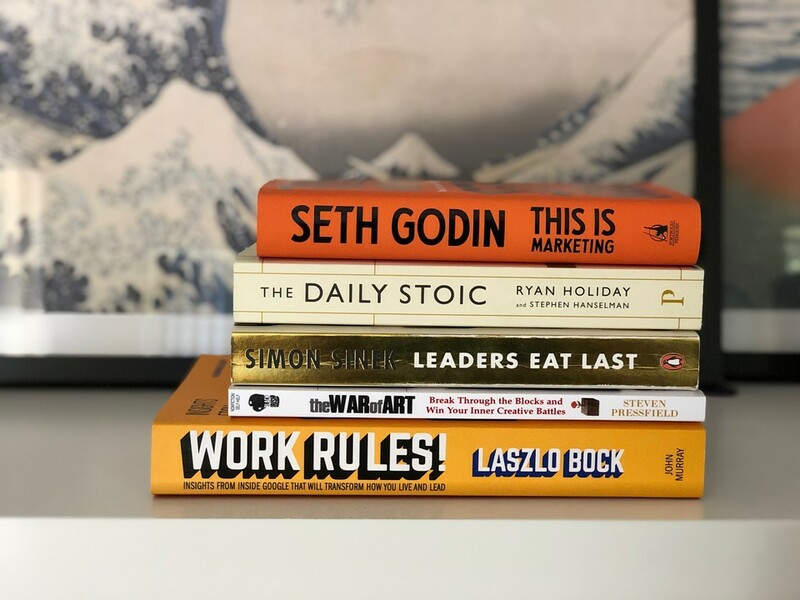 It’s designed to be read a page a day and each page begins with a pithy quote from stoic thinkers (Seneca, Marcus Aurelius and Epictetus), followed by clear commentary that helps modernize ideas for readers. Who I would recommend this book to: anyone interested in stoicism/mediation/mindfulness, people who don’t like change, highly emotional people. 2. The War of Art by Steven Pressfield. I’ve heard this book mentioned several times on The Tim Ferriss Show and I’m glad I finally read it this year. In this succinct guide, Steven lays out the common obstacles that plagues anyone working on a creative endeavor and then offers practical solutions to them. As a food/travel blogger, there’s been countless times where I’ve procrastinated and put off writing, now when this happens I can turn to The War of Art and get back on track. Who I would recommend this book to: creatives, procrastinators and anyone who’s suffered from writer’s block. 3. This is Marketing: You Can’t Be Seen Until You Learn To See by Seth Godin packs a ton of insights, strategies and case studies that reframes marketing from click bait spam to authentic engagements. After reading this book, I immediately told my colleagues about it and incorporated some of the learnings in my 2019 plan. Who I would recommend this book to: marketers, marketing students and people who think marketing is just advertising. 4. Leaders Eat Last: Why Some Teams Pull Together and Others Don’t by Simon Sinek explores in detail both excellent and terrible leadership. He eloquently highlights his ideas through an array of real life examples of successful leaders in government, manufacturing, and the military. I particularity enjoyed the updated chapter titled “A Practical Guide to Leading Millennials” – which offers strategies for both leaders of millennials and millennials themselves. Who I would recommend this book to: people managers, employees with difficult managers. 5. Work Rules! Insights from Inside Google That Will Transform How You Live and Leadby Laszlo Bock combines empirical research and his personal experience as the former SVP of People Operations at Google to help demystify the hiring and managing of people. Who I would recommend this book to: hiring managers, recent graduates, people who have no idea how HR works. Let me know in the comments below, what books you loved this year!